With plenty of exclusive slots being released, it’s time to get free spins on 1 of them – get up to 40 free spins this weekend on Call of the Valkyries at Coral Casino. The promotion runs until tomorrow (Sunday the 9th of September 2018) with 20 free spins up for grabs both today and tomorrow. To take part, you need to simply stake £20 on Call of the Valkyries to get 20 free spins. If you do this both today and tomorrow, you’ll get 40 free spins in total. Furthermore, each free spin is worth 25p each with no wagering requirements to complete – what you win is yours to do what you like with! In order to take part in this promotion, you need to make a deposit with your debit or credit card as Skrill or NETeller are not valid. 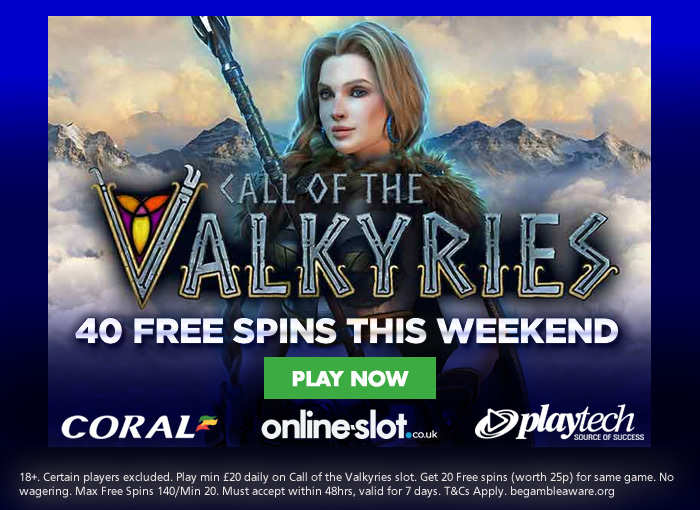 Call of the Valkyries is actually 1 of my favourite releases from Playtech in recent months – with a Norse mythology theme and with 5 reels and 25 paylines, you can spin away from just 25p per spin across desktop, mobile and tablet devices. It comes with a Touch of the Valkyries feature where Thor’s lightning bolt transforms a losing combination into a winning one by adding extra wild symbols. I particularly like the March of the Valkyries feature where you’re rewarded with respins. You will see stacked wild symbols moving across the reel set. Lastly, you have the Call of the Valkyries feature where you make picks from fallen warriors to win cash prizes. If you reach Valhalla, all your wins will be doubled! For full details, check out the Call of the Valkyries slot review where you can also try for free. If you like Norse mythology themed slots or watch Vikings, this is the promotion for you. Head to Coral Casino now and deposit just £10 to get £30 worth of bonuses.